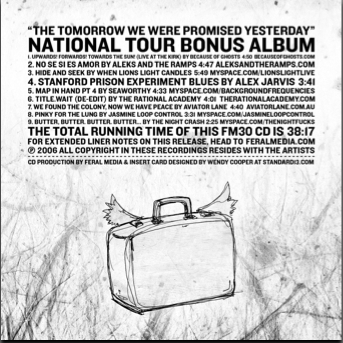 This release was only available with a limited run of the Because Of Ghosts album The Tomorrow We Were Promised Yesterday (FM27). Written and performed by Because of Ghosts. Recorded by Patrick Roussy. Recorded November 2004.
aleks composes sinister lullabies on his banjo. The ramps then arrange these tunes with sludgy drumming, delicate strings, glockenspiels and animalistic vocal exercises. Their hi-NRG live sets of frenetic indie chaos is usually interspersed with primary school dance routines and the dispersing of baked goods. Featuring Alex Jarvis, Jacob Pearce on drums and Gareth Skinner on Cello. Written by Alex Jarvis, Chris Smith & James Dixon. Seaworthy are quiet. Listen carefully. Mid 2004. Brisbane’s Fortitude Valley district battled sound restrictions and kids ran back to an early 90’s DIY culture. Somewhere close by The Rational Academy began writing songs. Drawn at first by the sonic scree of early Pavement records and a love for pop music accompanied by sombre male / female vocals, Meredith McHugh (gtr/vox), Benjamin Thompson (gtr/vox), Lawrence English (Electronics/Laptop) and David Heathorn (drum kit/guitars) began adjusting tuning pegs until melodies and clashing chords worked themselves into a meaningful translation of The Rational Academy a distant nod in the direction of their indie rock counterparts coupled with tender regard towards the avante garde and experimental composers within contemporary culture. Small DIY attack minus the scene heavy indifference of Electro-Clash. Jasmine Loop Control are Michael Skinner, Greg Taw, Vanessa Yeomans and Elisa Siipola. The Night Crash is Dan and Leigh. Dan plays guitar while Leigh hits the drums. They sometimes yell, too… Not very often though. The Night Crash is quite a bit louder than it really has to be.